Auxiliary Engine: John Deere diesel turbocharged 4045T Tier-3; 4 cylinders; 4.5 liter (276 CID); 115 HP @ 2200 RPM; Torque 355 ft. lb. @ 1500 RPM; 4 cycle; 4.19-inch bore; 5.00-inch stroke. Fuel/water separator included. Auxiliary Hydraulic System: Electrically operates hydraulic system (with the exception of hopper lift) without the auxiliary engine running. Amber High-Powered Strobe Light: Center mounted; 2,300,000 plus candle power with a minimum input of 23 Joules; 60 flashes per minute; with protective limb guard. 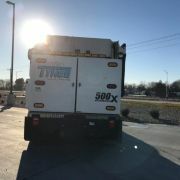 Four (4) LED rear amber strobe lights and two (2) LED stop/turn/tail lights mounted on rear doors of engine compartment promotes optimum visibility during sweeper operations. 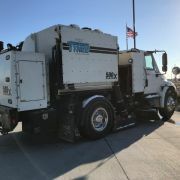 Dust Control System: 255-gallon capacity corrosion resistant, polyethylene water tank(s); slide-in type for easy removal; 5 GPM electric diaphragm type pump; low water warning light; spray nozzles around pick-up head; gutter broom(s) and inside hopper. Engine Protection System: Engine ECU shall be programmed to provide automatic engine monitoring and shutdown when engine problem is detected such as coolant temperature is too high, coolant level is too low or oil pressure is too low. Hopper: Non-magnetic alloy stainless steel with infinitely variable dump height from 24 inches to 132 inches. Hopper door opening shall be a minimum 68 inches wide by 57 inches tall and hydraulically locking with two (2) additional mechanical cam locks for air and water tight operator. Discharge chute minimum of 72 inches wide and 48 inches long with minimum reach of 22 inches without need of a side shift. Hopper Drain System: Allows sweeper to operate in wet conditions by draining water picked up. Hopper Lift: Two-stage scissor lift with lift capacity of 10,000 pounds. Scissor mechanism actuated by two (2) double acting hydraulic cylinders with integral counterbalance holding valves. Safety props provided. Left and right stabilizers automatically deploy before hopper beings dump cycle. Non-greaseable design. 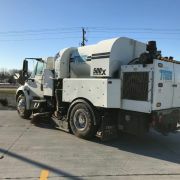 Hydraulic System: Specific for use within the design requirements of the sweeper and includes a 30 gallon reservoir; sight level/temperature gauge, dual 60 mesh suction line strainers; replaceable 10 micron spin-on tank filler/vent port filter; 10 micron absolute in-line return filter with restriction indicator, temperature/float switches. Automatic engine shutdown if oil level becomes too low; automatic blower pump shutdown if oil temperature becomes too high. 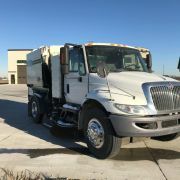 Instruments in Cab: All auxiliary engine controls located inside cab with multiplexed control system that integrates control panel to all sweeper functions. Engine programmed for isochronous governor feature for engine speed control. Multi-function data display for sweeper and engine status. 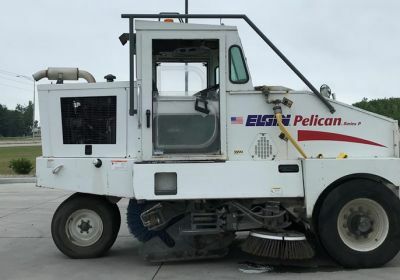 Includes re-settable and non-re-settable hour meters for the auxiliary engine; left hand, right hand and BAH brooms; pick-up head; blower. Dump controls in cab. Pressure Bleeder: Air pressure is deflected out allowing additional suction across the front of pick-up head. Manual control. Rubber Lined Blower: Driven using a fixed displacement heavy-duty hydraulic motor. Blower housing includes patented Tilt-N-Seal design with adjustable spring balance to insure long life of seal. Storage Compartment: 4.5 cubic feet capacity with lockable door. Mounted on left side on vehicle. 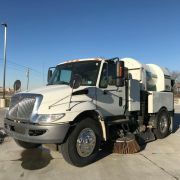 Twin Gutter Brooms, Floodlights, Parabolic Mirrors with Tilt Adjusters: Left and right side mounted 43” diameter wire filled digger type; adjustable floodlight each gutter broom; 12-inch convex mirrors on front fender extension. Variable speed control for each gutter broom is located on center mount console. 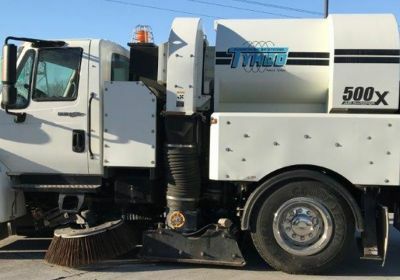 Each broom shall have a hydraulic actuated tilt capacity of 27 degrees operated from inside cab. Water Fill Hose & Rack: Flexible 20-foot-long water tank fill hose with 2 ½-inch hydrant coupling with rack mount. System incorporates air gap. Abrasion Protection Package: Hopper suction inlet liner, hopper suction tube liner, suction transition liner, pick-up head suction nozzle liner and pressure wear pads. Air Purge: Facilitates purging dust control system during freezing conditions. 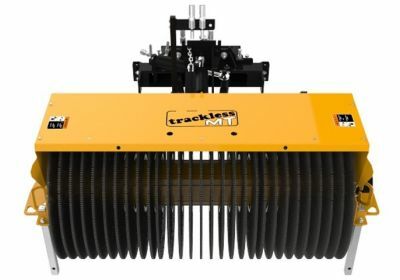 Reverse Pick-Up Head System: Allows unit to back up without damage to pick-up head. Stainless Steel Hopper Screen: Chip Seal/Milling application. 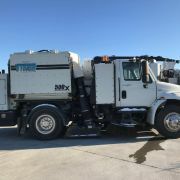 Sweeper Deluge System: High volume system is mounted in the hopper with a water fill hose quick coupler for connection to a fire hydrant. Also included in the system is a pick-up head cleanout system with a water fill hose quick coupler for connection to a fire hydrant. Engine: International Electronic MaxxForce 7; 385 CID 6.4L V-8; 50 State 200 HP @ 2600 RPM, 560 lb/ft torque @ 1400 RPM. Dual element air cleaner with restriction in cab; oil cooler; engine shutdown system; fuel/water separator. Transmission: Allison 2500RDS-P automatic 5-speed transmission. Front Axle: 10,000-lb. capacity with 10,000-lb. capacity suspension. Rear Axle: 23,000-lb. capacity two-speed. Hendrickson HAS 320, 23,000-lb. capacity air suspension; 9.5 ride height with shock absorbers. Tires/Wheels: Six (6) 11R x 22.5; 14 PR tubeless on single piece rims with 10-hole disc. 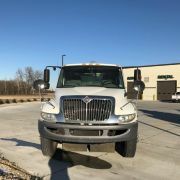 Frame: 80,000 PSI; 152-inch wheelbase; 84-inch cab-to-axle measurement. Brakes: Service – full air, cam type with 13.2 CFM compressor. Four channel anti-lock brake system. Includes air dryer. Steering: Integral power with 18-inch diameter wheel. Fontaine dual steering. Electrical: 110-amp alternator; two (2) 12-volt batteries (1850 CCA). Daytime running lights. Cab: Steel conventional with tilt hood; in-dash factory air conditioning; tinted safety glass; electric horn; 2-speed electric wipers with washers; remote controlled & heated mirrors; AM/FM radio with CD player; cigar lighter; map pocket; front & rear turn signals; electric tachometer; high back air suspension seats with cloth inserts; gauge package at operator stations; hand throttle control. Fuel: Fifty (50) gallon tank supplies fuel to truck & sweeper engines. Additional: Air horn, directional arrow stick; reverse camera with monitor in cab.